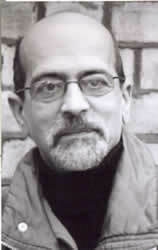 Predrag Finci, born in Sarajevo in 1946, he is in exile in London. He completed Gymnasium, Drama Studio and Philosophy at the University of Sarajevo, and a two year Counselling Course in London. He also studied at the University of Paris X (under Mikele Dufrenne) and in Freiburg (under Werner Marx). He completed his MA in 1977 and PhD in Philosophy in 1981. Before finishing his studies in Philosophy, he pursued an acting career, after which he was involved in academic work. Finci lectured at the Department of Philosophy and Sociology (University of Sarajevo) and gained his Professorship in Aesthetics. He is a founder-member of Bosnian P.E.N. He now lives in London and works as a freelance writer and research fellow at UCL. Graphomania is an affliction. It is like one of those harmless yet incurable minor diseases which are not fatal but for which there is no cure, but, which with time, becomes a bother both to the sufferer and to those around him. The first symptoms of this infection are to be noted at an extremely early age: the future sufferer usually begins as the school writer and philosopher, as a ‘poetic spirit’ whose written exercises the school-mistress praises and includes in the school wall newspaper, but of which the local urchins make fun mingled with sheer malice, spite and envy. This two-fold experience, that of praise and contempt, follows every writer like fate the whole of his life. It was the fate of such gifted ‘graphomaniacs’ as were Dostoevski and Nietzsche, whose ‘graphomania’ was justified by the greatness of their work, for which it would be purely arbitrary to state that it “might have been shorter”, since its extent arises at the dictate of its subject, which becomes clear with even a superficial insight into the various deformed, shortened editions of The Brothers Karamazov and The Will to Power. But, while great authors enter into writing as into destiny, before the eyes of the scribbler, at least at the beginning, there wavers only the bright vision in which his work is crowned with glory and its author surrounded by every form of praise and attention. The graphomaniac cares not for the work, but for the reputation it may bring him. He soon begins to call himself either critic or poet, adding this title to his signature wherever he finds the opportunity. He systematically visits book clubs and r eading rooms, enquiring what is new, visits public lectures at which he is more concerned with those present than with the lectures, visits the offices of periodicals and ritually crushes the exhausted editors who – at the end of their tether – applaud him … He preserves in his library everything he has ever published, and his briefcase carries at least twice as much, which, all taken together, is as nothing compared with what he has the unshakeable intention to write. The graphomaniac is distinguished by his persistence: nothing can shake him in his efforts to become a recognised and well-known public figure, in which his writings serve as both a go-between and a defence. Such writing is in no way creation, but a type of mental misdemeanour, in which one may clearly discern a neurotic need for self-assertion and pure auto-compensation. Such writing is not literature but a psychogramme. Looking on writing as a pleasant therapy, the graphomaniac is constantly and impatiently hurling himself into spiritual adventures in which there is neither spirit nor adventure, and all in the hope that the bulk of his ‘work’ will make up for the lack of talent. His thirst for constant expression always results in that type of tiresome exaggeration in which there is no trace of the particular enjambement which is the virtue of real literary works. The difference between a writer and a graphomaniac is that obvious difference between an author who has something to say and a scribbler who makes an irresponsible use of words, that is to say the difference between the need to create and casual expression. The graphomaniac may, indeed, become a true ‘authority’ for the unenlightened public, who with time becomes overwhelmed by the frequency of his incomprehensible literary works. And while, for the naïve reader, the graphomaniac can become a mental hazard and perceptive menace, the more serious connoisseur soon ceases to read such writing. Nor is he taken seriously by the experienced author for whom his every excursion is equally insignificant, since he knows that the graphomaniac is, at bottom, a cheat, an illusionist, who skilfully juggles with unconvincing illusions. For the graphomaniac reads in order stealthily to copy,gathers superficial information to parade as his own, to publish in order to flaunt his knowledge: he is a compiler whose works give the reader a sense of déjà lu. The graphomaniac follows cultural events so as to ‘react’ to them and to be ‘informed’; he echoes fashionable intellectual trends; he presents a cross-section of current spiritual life, in which he is capable of transforming every gold into lead. And although in principle he deals with ‘difficult subjects’, of which he speaks in high-sounding and pompous words – often creating ‘his own’ vocabulary and syntax, not only because grammar is foreign to him, but because he hopes that the language itself will express more than he himself was thinking, although for every failure of his thought he accuses that same language for not being capable of expressing his ‘thoughts’, that is to say the ‘truth’ – this scribbler has something to say about everything, since he has no opinion about anything, which he calls spiritual flexibility and intellectual broad-mindedness. And so he may rant into his ‘type-writer’, proclaiming his superficiality and lack of talent as fluency of writing. With all his fervour and enthusiasm, he never becomes a writer: he plays at being a writer, although in time he ceases to be aware of his play-acting. He becomes his own mask. Andrich said somewhere that he admired journalists, adding, in his manner of elegant and remote cynicism, that they were capable of writing a lot. In literary hyper-production which conforms to every other form of mass production, it is possible even to offer reliable directions as to how to write: there are various norms which must be maintained even in literary work. A rigid observance of definite norms easily becomes a pattern by whose careful application it is possible safely and surely to create every text. Often, and each time with justification, various versifiers and writers of nebulous articles are subjected to ridicule. But, no matter how harsh the parodying of canonised verbosity and unacceptable arbitrariness, graphomania has nonetheless flooded all regions of literature as not even to avoid the islands of philosophic stringency: in today’s flood of authentic ignoramuses, uncritical interpreters who do not interpret but merely repeat, and shameless compilers who, without recognition, steal other people’s ideas, it becomes possible to sketch out an ever more frequent recipe by whose application philosophers are preparing their words of wisdom. Here is an example of how one might prepare a philosophic telly-snack. Ingredients: two or three borrowed ideas, various seasonal literature, quotations, paraphrases, notes, pleonasms, neologisms, archaisms. The rest as required. Procedure: reject all activity, refer to one’s being highly occupied, distance yourself from everything that is not for personal benefit, express contempt for nation and society, sport, chess and for pleasurable life in principle. Preparation: firstly put an epoch-making title, but at once reject it with a subtitle. Immediately after a motto in Latin, make a comparison of various points of views and cultures, sharply criticise the European philosophical tradition both in parts and as a whole, express regret at one’s own times, attack all theologies, especially the Christian, reject mysticism and positivism, two or three philosophers to taste and one of the more modern philosophic trends, making use of such phrases as “he fails since…; he has not achieved …; his views are narrow because of …; this view is untenable because …”, point to the fact that Hegel, for instance, “has well noted” but – unfortunately – “did not realise that …”, which goes to prove a critical and intellectual acumen which Hegel can in no way deny, but under no circumstances make public comment on present colleagues, who, to judge by newspaper reviews, have exceeded not only all living and certainly all dead philosophers, but philosophy itself. (At the same time, between the lines, criticise them both as people and philosophers,proving that all that is worth while stands in inverse proportion with that failed nobody. When he says “sense” show that it is a matter of nonsense. If he says the concept is open, try to prove it closed.) Carry out ‘a bit of education in the public eye’, informing the uninitiated public of one’s own erudition, at the same time, retelling ‘in one’s own words’ what one has read. One should cite as many of the latest books as is possible and quote from them exclusively in foreign languages, especially if they are already translated, from which everyone can conclude that they have before them the text of a superior know-all. In so far as something has to be translated, then translate it so that the translation, if not utterly incomprehensible, will be at least more difficult and more muddled than the original text. Never quote living colleagues (only the dead can be respected without reservation), for their work does not enter the sphere of the ‘Weltgeist’, but in the case where such brochures may contain something worthy and truthful, freely adopt it (spiritual culture is common property!) Take a relaxed view of grammar. Write nouns with capital letters and proclaim each individually as a category or at least a concept. Occasionally omit the subject and treat the sentence as a fortuitous combination of words. Regularly invert syntagms, so that ‘all’ is included, and adorn with pleonasms the vacuities in long complex sentences whose beginning and end is difficult to determine, not to mention their content. With this, by all means, hint at the weakness and insufficiency of one’s own language and, without fail, quote Wittgenstein. Once the text has been made sufficiently obscure, announce that such a style is demanded ‘by the thing itself (whatever is in question)’,that philosophy is ‘difficult’ and not ‘amusement’, but quite the opposite. For the same reason exclude all humour, for philosophers are ‘dead serious’. If original ideas are unavailable, make a free choice of those of other people. Proportions: one original sentence to three borrowed, preferably contradictory ideas, or, better: simply three borrowed ideas which reduces risk to the minimum. It is best to have no opinion, or, at least, with the appearance of each new philosophical trend or insight in a new work, change it. Go in for alogismand paradox (the less logical the established link between concepts, the more original the philosophy), and turn each sentence around several times and on several occasions (at each occasion adding one’s bank account number). In so far as you are not aiming at demonstrating your own knowledge, behind which lurks a lack of talent, then write following exclusively your own conviction, ‘off the top of your head’, originally, i.e. irresponsibly. In so far as the text may touch upon art or some other aesthetic subject, make the text rhyme, and in case of supporting Marxist philosophy, make regular use of the adjective Marxist, whenever possible, as a decorative element. Complete the whole with a list of dilemmas and open questions. The text should abound with quotations, notes and pages. Bring this semi-prepared product immediately to the attention of the public. Then be dignified and important, slightly thoughtful and, as any insufficiently understood and appreciated master of his trade, slightly offended. They have tried to swindle us. They have tried to convince us that the worse the writer, the better the philosopher. Just as the auto-didact forever heaps his statements with what is mainly chaotic erudition, so the ungifted thinker turns philosophy into a collection of unbearable difficulties which are supposed to fascinate the lay public. written pages are empty. There is, indeed, a particular type of potential graphomaniac who rarely writes a single line, though he is forever announcing some epoch-making work or even an entire philosophical, always fundamental, system, of which, fortunately, nothing ever comes. Fortunately, because if thepublication of every book requires the destruction of a tree, then the graphomaniacs are not just a spiritual disaster, but an ecological danger. Then why do we say ‘in praise’? Firstly because your graphomaniac is never a lethargic sluggard. His effortful and vain labour discourages all timid and lazy beginners: the graphomaniac, in an indirect way, proves that literature is not an easy amusement. The graphomaniac, moreover, proves the maturity of the culture to which he belongs, though his significance is social rather than cultural in origin. He is a derivative of enlightenment and the product of a general growth of literacy. reader and a tireless contributor to cultural, artistic and other reviews. Finally he is the pre-condition for the rise of a true literature, for, with his enthusiasm, even if against his will, he opens space for future talents and with his work demonstrates how one should not write, what writing is not, which may serve as a negative training for every serious artist. But where the general level of education and culture advances, the graphomaniac loses his significance.